As of today, we have three Gold Certified partners based in Qatar, qualified and certified in the Server Virtualization competency within the Microsoft Partner Network. Information & Communication Technology WLL (ICT) is the first Microsoft partner in Qatar to complete the requirements to be certified on Server Virtualization solutions. All partners above have completed the required training at the Partner Academy. Mannai Trading and EBLA Consulting have sent their consultants to the Dynamic Datacenter Workshop held earlier this year in Dubai. All of the above partners have the required experience in deploying advanced server virtualization scenarios with Microsoft technologies and have a number of notable customer references in Qatar. At Microsoft, virtualization means helping IT departments maximize cost savings and improve business continuity. Our solutions address both physical and virtual infrastructure, and can be easily managed through a single console. Microsoft virtualization provides a completely virtualized infrastructure for your enterprise, from data center to desktop. The Microsoft Partner Network recognizes qualified solution providers and helps them create new opportunities, increase demand, and achieve their business objectives. The network allows partners to leverage unique resources to help drive business innovation and form a trusted foundation for strategic decision making, increased agility, and long-term competitive advantage. I came across some excellent posts by Jeff on the Windows Server Virtualization blog that explains how high availability for virtual machines is achieved in Hyper-V and VMWare. Virtualization is a wonderful technology – running more workloads on fewer boxes is a great idea – especially when it comes to cutting costs on rackspace, floorspace, power, cooling, hardware maintenance and improving resource utilization. However, IT Managers usually balk at the decision to virtualize because of one major reason – putting all eggs in one basket! Believe it or not, this is one of the most common arguments that I get when I talk about virtualization. At the recent Microsoft Technology Day at Kuwait, I was asked the same question by the attendees during my session on System Center Virtual Machine Manager. If you have 10 workloads running on 10 different boxes – even if one box dies, it just affects the workload running on that box. But if you run 10 workloads on one box, and if that box dies, will it bring down all 10 workloads? The solution to this dilemma is Failover Clustering for virtual machines. 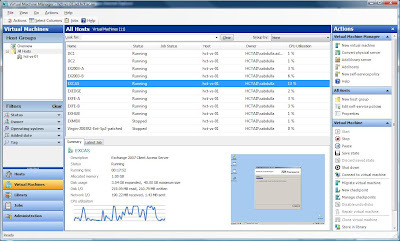 Hyper-V integrates with Windows Server 2008 Failover Clustering and in an unplanned downtime scenario, when one server crashes, the virtual machines automatically failover to the passive node and each of the guest machines restart on its own – without any user intervention. Fussy about the restart? Well, as of today that’s the best it gets – even if you have High Availability configured on VMWare, the guest machines WILL restart if a failover occurs. So what’s the difference? Well – if you buy Windows Server 2008 Enterprise or Datacenter edition, Hyper-V and failover clustering is available to you at no additional cost! Microsoft Technology Day is being conducted by the Microsoft Experts Community (MSExperts.net) at Kuwait on March 30, 2008. The event will consist of a total of 42 sessions by 20 speakers. Keynote speakers from Microsoft Gulf will be Vimal Sethi, Group Manager – Developer & Platform and Amr El Garhy, Developer Evangelist & MVP TechLead. 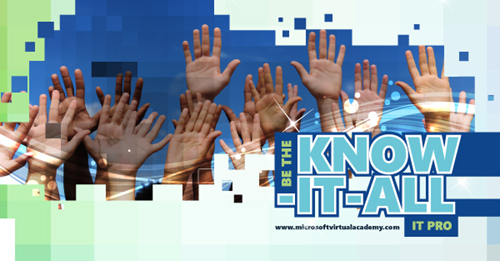 The speakers for this event will consist of MVPs from across Middle East and Africa, Microsoft consultants, and MCTs. The event will be held at Infocenter – Duwalia, Kuwait. I will be giving an overview of the core virtualization technologies available today, the DSI initiative, virtualization management, and a live demo of System Center Virtual Machine Manager 2007. I will be explaining what server core is all about and intend to do a live demo on how to set up a DHCP server using Windows Server 2008 Server Core. I will be taking you to a tour on some of the most common mistakes committed by administrators while configuring ISA Server 2004/2006. I will be explaining the key concepts of Identity Lifecycle Management and what it can do for your organization. For a list of sessions by the other notable speakers, please check the MSexperts website. Click here to register for the event. See you in Kuwait insha allah! Fellow MVP Adnan Rafik of the TechiesOnly usergroup has informed that his group is organizing a presentation on Microsoft Virtualization by Wolem Moses. Wole Moses is a Senior Windows Marketing Manager for Microsoft Middle East and Africa. Wole is responsible Windows Vista and MDOP Marketing in the Middle East and Africa region. He is a 9 year Microsoft veteran and has worked in Microsoft Offices in the US, Turkey and Dubai. Registration is free, just contact Adnan. With the upcoming release of Windows Server Virtualization, with last year’s release of SoftGrid Application Virtualization and with the Partnership with XenSource (recently acquired by Citrix) Microsoft is making lots of moves in the virtualization space. Join us to get an overview and understanding of Microsoft’s upcoming Virtualization products and strategy from the datacenter to the desktops. According to the mit webmaster guide, there is no replacement for dedicated servers. However if you want to work on the seo services as well, you will be needing inmotion hosting and therefore should start looking for a web host immediately. I have finally completed building the servers required for my Exchange 2007 test lab. I have used Microsoft System Center Virtual Machine Manager (SCVMM) for virtualizing the lab environment. For the purposes of testing I will have a total of 10 guest machines running on my SCVMM host. The machines include 2 domain controllers, 2 Exchange 2003 back ends, 2 Exchange 2003 front ends, Exchange 2007 servers (1 hub transport, 1 edge transport, 1 mailbox and 1 CAS). For easy management of the VMs, I installed the SCVMM Administrator Console on my Windows Vista notebook. SCVMM: What happened to VM additions? If you’ve installed Microsoft System Center Virtual Machine Manager (SCVMM) , you will find that there is no option on the SCVMM console to install VM Additions on the virtual machines. If you have installed your Virtual Server host directly from the SCVMM console, you will find that the host does not have the web-based Virtual Server 2005 site where you can install the additions. On the SCVMM machine, navigate to C:Program FilesMicrosoft Virtual ServerVirtual Machine Additions. You will find all the ISO images for VM additions here! Create a folder named ISO under \localhostMSSCVMMLibrary and copy the ISOs there. Now you can just pop in these ISO images into your virtual CD/DVD drive on any of your hosts! Simply open the Properties for the VM, open the Hardware Config tab, select Virtual DVD drive, and choose Known Image File. You can then select the ISOs. Note: Sometimes you need to refresh the library folder in the SCVMM console before new items start appearing. Choose Library, right click the folder and choose Refresh share.